Posted on October 7, 2014 by Anna C.
The Arizona general election will be held on November 4, 2014. Reproductive health care access has been under attack, both nationally and statewide, but Planned Parenthood Advocates of Arizona has endorsed candidates who have shown strong commitment to reproductive justice. To acquaint you with our endorsed candidates, we are running a series called “Meet Our Candidates.” Make your voice heard in 2014! Andrew Sherwood just completed his first term representing his district in the Arizona House of Representatives, during which time he came out swinging against bills that were designed to marginalize the LGBTQ population and harass patients seeking reproductive health services. 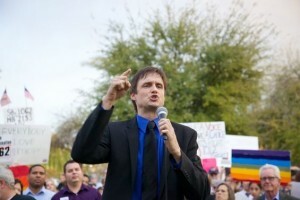 The 26th legislative district covers parts of Tempe and Mesa, and is currently represented in the House by both Mr. Sherwood and his seatmate Juan Mendez, both of whom have received Planned Parenthood Advocates of Arizona’s endorsement for their commitment to reproductive justice, equality, and education. Mr. Sherwood is an Arizona native whose political involvement stretches back before his election to the House. In 2011, he helped spearhead the Democratic Party’s successful recall efforts to oust Russell Pearce (who you may remember as the architect of SB 1070, or more recently for his offensive remarks advocating for the forced sterilization of poor women). He is an Arizona State University graduate who has made LD 26 his home. Andrew Sherwood kindly spoke to us over the telephone on October 3, 2014. I got involved in politics in 2006. I started working on a campaign back in 2008; I ran my first campaign in 2010. I was elected in 2012, and so I’ve been serving for the last two years and I’m up for reelection. I’ve worked on both sides of the political equation, so I’ve been involved in the party apparatus as well as the elected-official side. I think that having worked on both sides makes me better at each of the others, if that makes sense. Before politics I worked in the private sector as well: I ran a small business, I’ve been a business executive. I’m from Tucson, Arizona. I moved to Phoenix, in Tempe, so that I could go to Arizona State University. And I feel really lucky to have gone to ASU. It was a life-changing experience. I’m one of those students that didn’t expect their whole life to go to college, and so for me when I had the opportunity to do it, it didn’t just provide for me all the usual opportunities that colleges do, it provided the mindset, which is the ability to have this economic mobility. And that’s why I’ve always run campaigns with a heavy emphasis on education. In my personal life, I love animals, I love sports, I like walking dogs, I like rock climbing, I like boxing, and of course there’s not much time for any of these things anymore now that I spend almost all of my time in politics. I’ve never missed a vote, I’ve never missed a day at work, and I put about 80 to 100 hours a week into the Capitol. So I work very hard at this job. Last legislative session, you voted against HB 2284, which now permits the health department to inspect abortion clinics without a warrant. What do you think about this new law? Thank You 2014 Luncheon Attendees! Thank you for supporting Planned Parenthood Advocates of Arizona’s 2014 I Stand luncheon. We are tremendously grateful for the wonderful feedback we have received about the event — as well as all the generous donations. Thank you for helping us “Make it Happen in 2014”! This year’s event was unashamedly political. That focus, and our speakers’ urgency, is driven by today’s reality. For many of the 45,000 women, men, and young people who come to Planned Parenthood Arizona each year — and many thousands more like them across our state — the challenges to access accurate health information and medical services are real and increasingly insurmountable. I want to address our Republican supporters who may feel personally criticized when Planned Parenthood Advocates and I take aim at Republican legislators who are leading the assault on women’s health care. This is not the Republican party of the past. I was raised in a Republican family. My 83-year-old mother was an elected Republican author of the modern Illinois state constitution when, in 1970, she successfully defeated a proposal to include an abortion ban. My hope is that we will again see a day when candidates on both sides of the ballot support Planned Parenthood’s vision and values. Most of us who support Planned Parenthood are motivated by our interest in providing hands-on health care and education. When we think of Planned Parenthood, we think of hope-filled futures in which young women and men can complete educations, get jobs, and raise healthy families. The gritty reality of working in the political trenches wasn’t in our plans. I am grateful that Planned Parenthood Advocates of Arizona has endorsed Felecia Rotellini, Terry Goddard, and Fred DuVal because these individuals clearly recognize the crossroads at which Arizona finds itself with respect to sexual and reproductive health and rights. In my remarks at the opening of these events, I cited my profound concern for the health and futures of the 96,000 young Arizonans who will enter their teens in 2014. I know that you share my concern. Thank you for standing with Planned Parenthood.